Languages: Miss Ruth Nyambura Kinuthia can speak Kiswahili. She is also fluent in English and intermediate in French. - Video by India Arie. Favorite Designer: Ruth Nyambura’s favorite fashion designer is Versace, because his designs are inspired by strong women. At the same time, his collections look classy and chic. Favorite Food: ‘Biriani’ is Ruth’s favorite food. It is prepared with rice, local herbs and spices and pieces of lamb or mutton. Weirdest dream: I was walking in a park one sunny afternoon. There were children playing around the park. Just in the middle of the park, an army of ants are working to build up a road around the park and the children are helping them by picking up flowers from the park and decorating the highway. Message to other Miss World 2008 contestants: You are not only representing yourselves but also your country. So take every challenge in a positive manner and work hard and stay focused. Warm, friendly, outgoing, ambitious, determined and focused- this is how twenty two year old Miss Ruth Nyambura Kinuthia likes to describe herself. Her motto in life is, "Never give up, persistence pays when all else fails". In Miss World 2008, Ruth Nyambura expects to score high in all the areas but she believes that she would be able to show her true strength during the interview session, where she would interact with the judges. Ruth Nyambura wants to become a special programmes co-ordinator for the United Nations. A diploma holder in Law and International Computing, Ruth Nyambura is currently an undergraduate, majoring in International Business Administration. Ruth also likes to work with young people. She worked with a school situated in a slum in Nairobi. The students of the school lost their parents due to HIV/AIDS. Together with them, Ruth participates in various community works and raise money for the school. Ruth also organized the launching ceremony of a Gender Recovery Unit in one of the national hospitals situated in her home town. It was quite a challenging event for Ruth. It taught her to keep her cool under pressure. 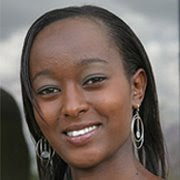 An avid sportsperson, Ruth Nyambura likes playing tennis, cycling, scuba diving, rock climbing, and aerobatics. She also loves to watch movies, reading novels, and singing. Ruth also loves dancing and enjoys salsa dancing, hip-hop and contemporary dances. Ruth has great interest in calligraphy and writing poetry.